Campement Faro Decouverte, safari privés. Faro Decouverte private guided safaris camp. Embracing the style of local architecture, the camp is perfectly integrated into the surrounding forest. Built on the edge of the Faro River, it offers stunning views of the natural pools and beauty beyond. This idyllic setting offers poetic inspiration and invites quiet disconnection and meditation. 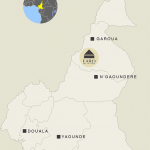 Faro Decouverte is located in Northwestern Cameroon within zone 18, a protected area bordering Faro National Park. Its GPS coordinates are: 8.02 ° to 8.27 ° North and 12.97 ° to 13.37 ° East. The open territory is landlocked between a mountain chain rising to 1300 meters, the magnificent Faro river and one of its tributaries, Mayo Ndugba, a natural barrier to poaching during the rainy season. The reserve boasts 250 km of tracks without villages or inhabitants. 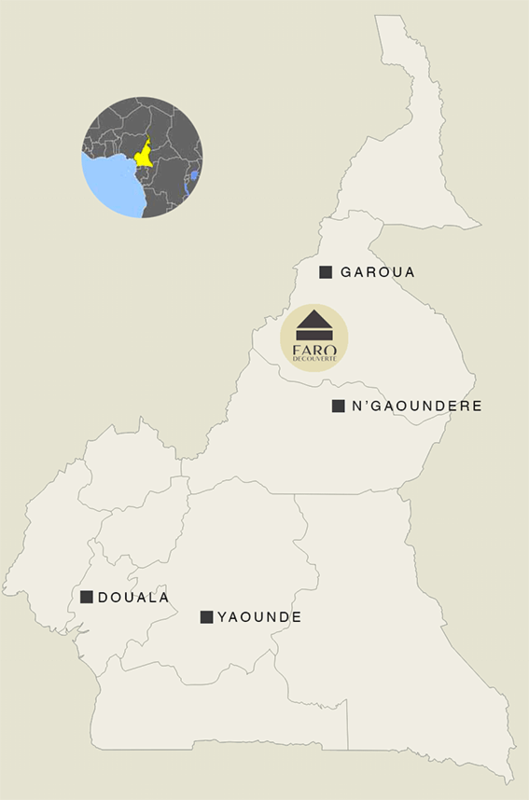 Faro Decouverte can be accessed from Ngaoundere in the South or Garoua in the North. Ngaoundere is 175 km from the camp by road including 75 km of track with a driving time of 4 hours. Garoua is 250 km from the camp with a total driving time of 5 hours. 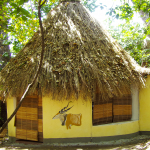 The “boukarous” bedrooms and thatched roof huts blend harmoniously with the natural setting. 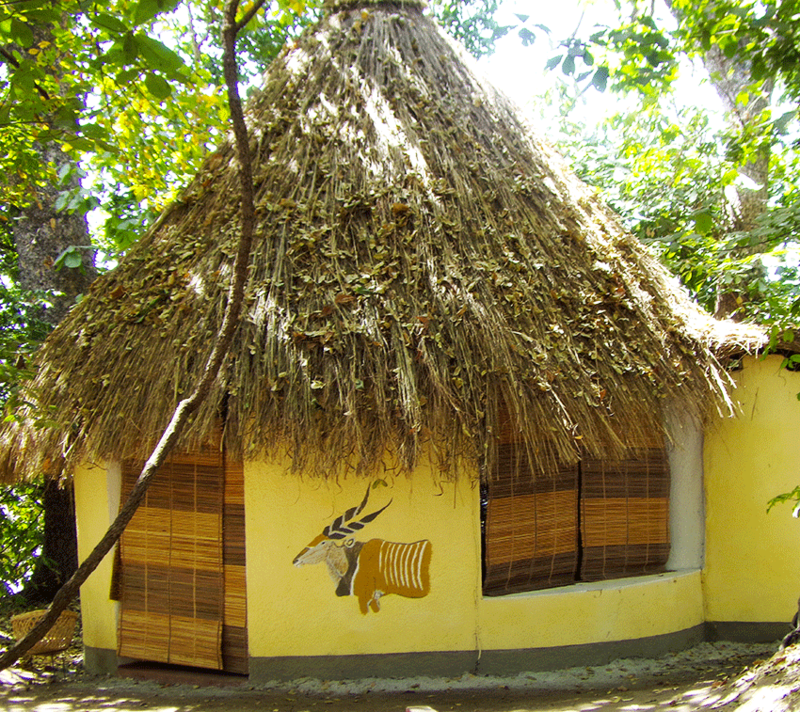 Bedrooms are furnished with king size beds under large mosquito nets with private bathrooms. Daily laundry service is included. To ensure a private safari experience, Faro Decouverte allows a maximum of 5 guests at the camp. Faro Decouverte offers locally sourced family and French cuisine including local specialties and drinks (only Champagne is chargeable). The camp is solar powered with filtered water. The living room boukarou opens on to a large terrace overlooking the stunning Faro river. While relaxing on the terrace, guests can observe hippos resting on beaches or cooling off in the river, western Kobs on river islets and playful colobus and vervet monkeys.